Update: Philo TV has started offering the Hallmark Channel and 42 other popular cable channels for only $16 a month! That’s almost half as much as the previously cheapest option! The Hallmark Channel has seen a sudden surge of popularity in the last few years that might take you by surprise. Even when other entertainment stations like AMC, A&E, and USA saw downturns, Hallmark was boasting double digit increases in viewership. The station has hit a perfect mix of family-friendly shows, lovable characters, and high production values. Thankfully, cutting cable doesn’t mean cutting the Hallmark Channel. There’s actually quite a few ways to get Hallmark Channel without cable, meaning you have options to keep the great content without the expensive bills. Previously, the top three options to get the Hallmark Channel were Sling TV for $30 per month, DirecTV Now for $35 per month, and PlayStation Vue for $44.99 per month. However, Philo TV has recently began offering the Hallmark Channel for only $16! Not only will Philo TV give you the Hallmark Channel, you’ll get 42 other popular cable channels that we’ll outline below. There a few other options that are a bit more expensive, so we opted not to outline them. They are larger packages that offer a great selection of channels, but aren’t the best option if you’re only looking for The Hallmark Channel. If you’d like to see them, or have some other channels you’re looking for, our guide page will automatically generate a custom cord cutting report for you for free! What do I need to watch the Hallmark Channel without cable? Unfortunately, the Hallmark Channel isn’t available to be picked up for free with an antenna. You can, however, stream it live with the help of subscription streaming services. These services are similar to Netflix or Hulu and offer the same live Hallmark Channel that you’d get with cable. Unlike cable, these services don’t require a contract and can be cancelled at any time without a termination fee. They also have the added benefit of not requiring you to use proprietary rental hardware. They do require certain hardware to allow you to watch it on your TV, but the devices are fairly inexpensive and sold by third parties. If you’re not planning to watch The Hallmark Channel on your TV, all of the major streaming services can be watched on a mobile device or a computer without a problem. If that’s how you plan to watch it, you won’t need to purchase an additional streaming device. However, if you want to watch the Hallmark Channel on your TV, you’ll need some help. Watch the Hallmark Channel live on your TV with a Roku. To do this, you’ll need a streaming device. A streaming device is basically a small computer that hook into the back of your TV and turns it into a Smart TV through your internet connection. Each streaming service has it’s own list of compatible devices, but there is a pretty big overlap between them. Whenever possible we try to help guide our readers to the cheapest and most reliable devices. For streaming devices, this means we typically suggest a Roku. 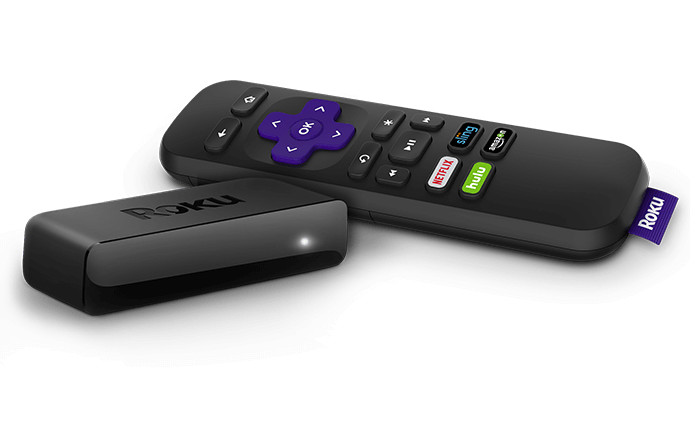 Roku is a huge name in the streaming industry and comes in a variety of different models that range from $29.99 for their basic Roku Express to their $89.99 4K Roku Ultra. Before you settle on a streaming device, make sure that the service you’re subscribing to doesn’t offer any device deals that could save you some extra money! Sling in particular has some really good ones that can save you over $50. Being able to get the Hallmark Channel without cable through Philo TV is huge news for cord cutters. Philo TV is hands-down the cheapest option to watch the channel and is quickly setting a new standard for quality and price in the streaming industry. Philo TV was made because its founders realized that not everyone is interested in sports. Sports channels like ESPN and local networks like Fox that air games are expensive for content providers to include in their packages. Because of this, services charge more money for less channels if they include sports options. Philo TV took a complete opposite approach to cord cutting and excluded these channels all together. Although you won’t get sports or local stations, Philo TV comes jam-packed with a lot of the most popular channels. These channels include A&E, AMC, Food Network, HGTV, TLC and plenty more. Some of these channels, like Nickelodeon, are surprisingly difficult to come by when you cut cable. The image below shows the current Philo TV channel lineup that includes the Hallmark Channel, Hallmark Drama, and even Hallmark Movies & Mysteries all for only $16 a month. If you’re interested in Philo TV but feel it might be missing something, they also offer a slightly larger package for only $4 more a month. For $20 total a month, you’ll get American Heroes Channel, Cooking Channel, Nicktoons, and 9 other additional channels. The image below shows all 9 of these added channels that come with the bigger package. One of the best things about Philo TV is how confident they are in the quality of their service. Not only do you get the typical 7-day free trial that most streaming services offer, Philo TV takes it even one step further. In order to start trying Philo TV, all you need to do is give them your mobile number. No billing information is required at all, meaning you can’t possibly forget to cancel it if you’re not loving it. Keep in mind that after 2 days you’ll need to put in billing information to get the other 5 days of the trial, but 48 hours is a lot of time to test a service. 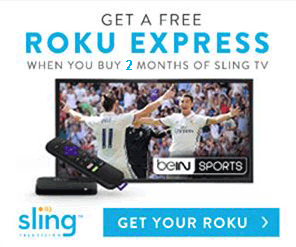 One of the most popular names in live TV streaming is Sling TV. Sling TV has built a one of a kind cord cutting experience that gives a lot of customization to its subscribers. Rather than offer one or two big packages full of channels, Sling reduced the number of channels per package, making each one more affordable. Although you can’t pick and choose each individual channel, Sling TV is as close to “al la carte” cord cutting as you can get. Sling TV is broken out by “core” and “add-on” packages. The main core packages are Sling Orange and Sling Blue and each cost $25 per month. Sadly, The Hallmark Channel isn’t available in either of these core packages and must be bought in the Lifestyle Extra add-on package for $5 more per month. As the name would imply, the add-on packages cannot be purchased separately and have to be added on to one of the core packages. Whether you choose to go with the Sling Orange or Sling Blue package, the added cost of the Lifestyle Extra brings the total price for The Hallmark Channel to $30 per month.. Although $30 a month for a single channel seems expensive, keep in mind Sling’s core and Lifestyle Extra packages come with other channels too. Sling Orange offers the three ESPN channels, Disney Channel, Freeform, and TBS that aren’t available in Sling Blue. The table below shows the current channels in the Sling Orange package available at our Boston Location. Sling Blue trades ESPN, Disney, Freeform, and TBS for regional sports networks, BET, Nat Geo, NFL Network, Nick Jr., SYFY, TruTV, and USA. The table below shows the current channels in the Sling Blue package available at our Boston Location. In addition to the 30 channels you’ll get with Sling Orange, the Lifestyle Extra adds some more of its own. Not only will you get the Hallmark Channel itself, you’ll also get Hallmark Drama, Hallmark Movies and Mysteries, and 11 other popular Lifestyle channels. The complete Lifestyle Extra channel lineup is below. If you’re looking for more than just the minimum way to watch the Hallmark Channel without cable, Sling offers numerous other extra channels to customize your experience. These include more sports stations, comedy channels, new channels, and even channels specifically for kids. To see a full list of channels included in Sling’s packages be sure to check out Sling.com. 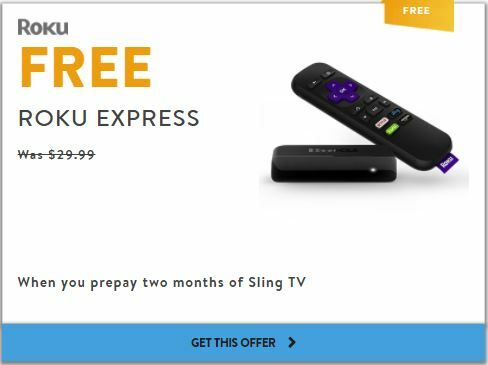 Before you jump right into cutting the cord with Sling TV, it might be worth it to try their 7 day free trial. If you’re not familiar with other streaming services, it will give you an opportunity to check their reliability and navigation to make sure it’s right for you. If you don’t need the free trial and would like some additional Sling offers and discounts, they have offers for most major devices that can save you a lot of money on hardware. We’ve aggregated and organized all of the offers in our Sling offers and discounts article to help you get the most savings. DirecTV Now is another streaming service similar to Sling TV. The name is a bit confusing because unlike DirecTV, DirecTV Now doesn’t require a contract or satellite at all. It’s a completely different service also owned by AT&T that could really use a name change. Naming difficulties aside, DirecTV Now is a great streaming service and is the second cheapest way to watch the Hallmark Channel without cable. At $35 a month, DirecTV Now is a little bit more expensive than Sling, but comes with a lot more channels. With over 70 channels in their cheapest package, DirecTV Now actually costs less per channel than Sling Orange + the Lifestyle Extra. DirecTV Now also offers local stations like ABC, FOX, and NBC that are only available on Sling with its slightly more expensive Blue package. Because it carries local stations, the channel lineup for DirecTV Now is dictated by your location. The image below shows the available channels at our Boston location for DirecTV Now’s Live a Little package in white. The grayed out logos are for channels that can be picked up by increasing your package size and price. Make sure to put in your address on their website to check what’s available for you. As you can see, DirecTV Now has way more channels than Sling, and didn’t just stuff the package full of “fluff” networks that no one watches. It supports a lot of incredibly popular networks and offers a similar experience to cable without the price. DirecTV Now is actually one of only two ways to watch Nickelodeon without cable (the other being Philo TV), a channel that we see requested a lot. Like most streaming services, DirecTV Now offers a 7 day free trial. Currently, they also offer a discounted rate for the first three months that’s hard to beat. Rather than the 7 day free trial, new users can sign up for the Live a Little package for only $10 a month for the first three months. Luckily, the Hallmark Channel is in the Live a Little package so we can take advantage of the discounted rate. After the three months, the bill increases back to $35 a month, but you’ll still have saved $75. Click here to take advantage of the discounted rates. PlayStation Vue’s name is equally as confusing as DirecTV Now’s, if not more so. Sony’s streaming service was initially launched on the PlayStation only, but was quickly added to other devices as the subscriber count grew. It’s now supported by most of the major streaming devices contrary to what the name might imply. PlayStation Vue is more similar to DirecTV Now than Sling and offers four larger packages to choose from. Its cheapest package, Access, costs $39.99 a month and comes with over 45 channels. Sadly, the Hallmark Channel isn’t included in the Access package and you’ll need the next size up to watch it. The second cheapest package offered by PSVue is their Core package and adds about 20 channels for $5. At $44.99 a month, PlayStation Vue costs a bit more than DirecTV Now and close to twice as much as Sling TV if you’re specifically looking for the Hallmark Channel without cable. With that in mind, PlayStation Vue does offer some channels that aren’t available included in the cheaper Sling TV or DirecTV Now options. The most notable of these channels are sports networks like the MLB Network and regional sports networks like NESN. The complete PlayStation Vue Core channel lineup for our Boston location is below. 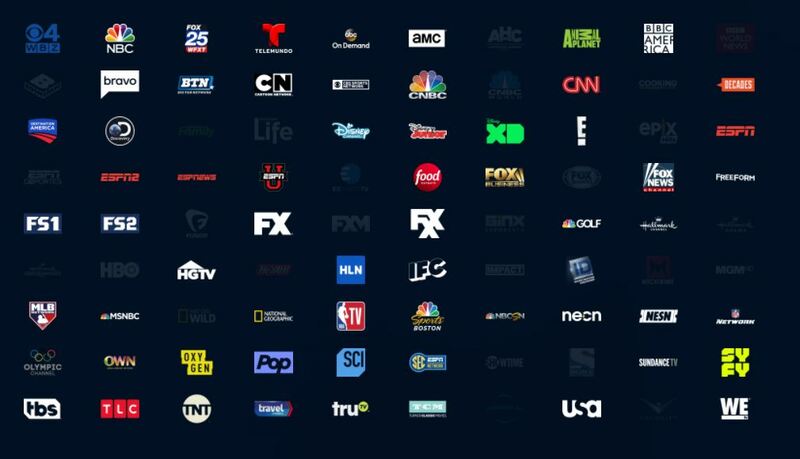 As with DirecTV Now, make sure to check the lineup for your specific location to ensure you get the local channels you’re expecting. PlayStation Vue is a streaming service that constantly impresses us, particularly for sports. It can be quite difficult to watch some fast-paced sports like hockey if your stream isn’t 60 fps. Not all of PSVue’s channels are played at 60 fps, but most of the sports networks are and it really makes a huge difference. Out of the three services outlined so far, PlayStation Vue has the best DVR. DirecTV Now only announced their DVR this month and Sling’s costs an additional $5 a month. PSVue’s DVR allows you to record most channels and will save them for up to 28 days. The ones you can’t record are due to streaming rights (like Disney, ESPN, HBO). You also don’t have any fast forward restrictions on commercials like you do with some other services (looking at you YouTube TV). The only channels you can record and not fast forward on are the FX channels. If you’re a sports fan that’s also looking to watch the Hallmark Channel without cable, there’s a good chance PlayStation Vue is your best bet. They’ve been around a long time and have continued to improve their channel lineup and reliability. They had a slight technical hiccup for the last Super Bowl, but hopefully it was a fluke and doesn’t happen during the next big event.